Strategic Energy Innovations’ (SEI) zero waste programs are working to help schools and districts around San Francisco’s Bay Area make the move to sustainable waste management. SEI currently work with 19 schools in Marin and West Contra Costa counties to make a shift in campus culture toward responsible waste sorting, waste reduction, and environmental stewardship. To do this, our programs help schools shift their physical infrastructure and the campus and community culture around waste. SEI has two zero waste programs in partnership with local governments: Zero Waste Marin and Zero Waste Schools San Pablo. Through these programs, SEI provides holistic support focused on campus-wide education, proper infrastructure, and student leadership. These programs also help schools meet the California state mandate for commercial sites (including schools) to recycle and compost, as laid out in Assembly Bill 32, the Global Warming Solutions Act. Schools that request to join SEI’s programs often do so because they want to address the large volumes of trash generated on campus and meet their overarching sustainability goals. SEI’s support provides the knowledge and tools schools need to divert large amounts of waste from landfill. The schools in our programs have made tremendous strides, and this article highlights two schools’ efforts to reach zero waste, each representing a different stage of the zero waste journey. 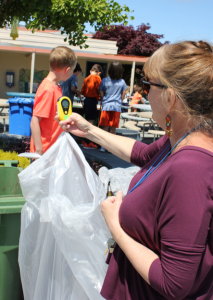 Bacich Elementary School is one of SEI’s Zero Waste Marin schools that launched in the 2017 – 2018 school year. They are located in Greenbrae, California and have a student population of 620. While Bacich already had recycling and composting programs in place on campus, the school knew they could do a better job implementing these programs throughout the school. To kick off Bacich’s participation, a team from SEI assessed their site and noted areas around campus that would be key points for waste collection and installation of landfill, recycling, and trash bin stations. After this infrastructure assessment, the SEI team returned to the Bacich campus to conduct a waste audit of key locations around campus. The team audited trash from the cafeteria, the staff room, a classroom, and the playground to understand sorting practices and common mistakes. This information was shared at a staff training, as well as with administrators and custodians. After the audit, new infrastructure was ordered for inside and outside of the school, and SEI team members educated the Bacich campus and community on the principles of zero waste. The Zero Waste team visited every classroom on campus to teach students about waste sorting and to hear their ideas on how they could make their school zero waste. 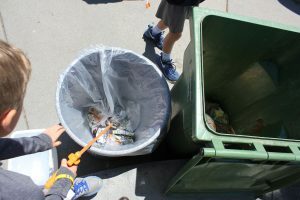 Third- through fifth-graders who were particularly interested in reducing waste on campus were recruited to join their school’s green team and a leader was chosen from each grade. Bacich benefits enormously from a dedicated staff, including principal Sally Peck, green team leads Lisa and Alejandra, and their custodial staff Jesus, Medhanie, and Jimmy. All staff at Bacich are on board with the zero waste program, which has facilitated a holistic cultural shift toward zero waste. The school’s dedication to this program is reflected by the strength of their green team. Green teams are vital to the success of zero waste programs because they are able to make the message of zero waste relatable to their peers and are instrumental in shifting campus culture. Last year, Bacich’s Green Team numbered 80-100 students. These students were at lunch every day to help their peers answer waste sorting questions. Their passion is one of the key reasons that Bacich is able to maintain almost perfectly sorted lunchtime waste. During their pre-audit, it was found that Bacich students were 63% accurate when sorting lunchtime waste; by the end of the school year, they were 96% accurate when sorting at lunch. Bacich’s Green Team also leads creative zero waste initiatives on campus. Last year, third-grade lead Lauren proposed a trash reduction competition between the grades for Earth Day. For the entire week leading up to Earth Day, green team members weighed trash created by each grade. Each day, all grades consistently produced between half a pound and two pounds of trash at lunchtime. This success was celebrated with a schoolwide popsicle day and Earth Day activities. The passion, dedication, and creativity at Bacich have created a successful culture of zero waste. This year, Bacich is looking to further reduce what ends up in their garbage – utensils, milk cartons, and wrappers are the most common items, so they switched to compostable bamboo and birch utensils at lunch. Currently, the lunch service across all grades creates less waste than one standard size garbage bag! Bacich’s green team is also promoting No Waste November by making an assembly announcement, creating a video to share with the rest of the school, weighing lunchtime trash, and sharing tips for eliminating waste at school and at home. SEI is in its second year of implementing a zero waste schools program at Montalvin Manor Elementary School, which serves over 430 K-6 students in San Pablo. Unlike Bacich, Montalvin is starting their zero waste efforts from scratch. To get their program started, SEI coordinated a team that includes three green team teachers and the principal to lead zero waste efforts on campus. SEI also helped Montalvin set a vision of a zero waste campus and identify concrete steps to reach that goal. In its first year, Montalvin’s program focused on green team education and taking a deeper dive into promoting a zero waste campus culture. Fourth- and fifth-grade students were recruited to join the school’s green team and monthly meetings were held to train green team members. At these meetings, green team members played sorting and waste games and learned how to manage recycling on their school’s campus. Since the inception of Montalvin’s Green Team, students have implemented a recycling system that services all classes on campus and ensures that recyclable classroom material is sorted and collected. 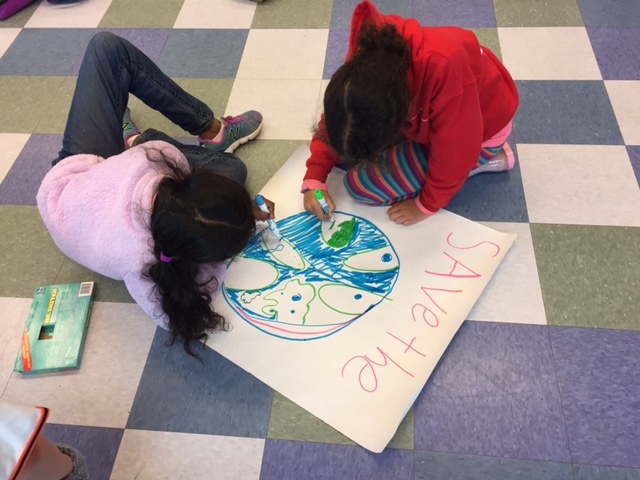 Montalvin Green Team members also spent a significant amount of time last year planning for a schoolwide Earth Day assembly to spread their core message of reduce, reuse, and recycle. The students brainstormed ideas on what they wanted to communicate to the rest of the school, and then drafted a script for their assembly skit. The assembly was an opportunity for the green team to present their work in a fun and creative way. Entering the program’s second year, SEI continues to host monthly green team meetings at Montalvin. One of the major initiatives for this year is to launch a composting initiative during lunchtime to prevent organic material from going to landfill. SEI purchased compost buckets for each table in the cafeteria. Students have decorated the compost buckets and will pilot a compost system at lunchtime beginning with the older students. Removing food from their waste stream will be a significant step toward zero waste. Zero waste can seem like a lofty goal, especially on elementary school campuses. However, the students, teachers, administrators, and custodial staff in SEI’s programs exhibit the passion and dedication that is integral to making this switch. We have found that it’s key to have consistent infrastructure and messaging, a holistic plan that brings together various stakeholder groups on campus, and a green team that is interested in leading the way toward zero waste. If your school is interested working toward zero waste as well, visit the Strategic Energy Innovations website to find our Zero Waste Guide, which has many of the resources and background information we use in these programs. Casey Fritz is an Associate Project Coordinator for Strategic Energy Innovations (SEI), where she manages SEI’s zero waste programs. She also works on SEI’s other education programs, such as hands-on energy and sustainability projects in California high schools and the annual Energy Conservation Competition. Prior to joining SEI, Casey was a student at the University of California, Berkeley, where she studied marine science and minored in history. She was a research assistant in an ocean chemistry lab at the Lawrence Berkeley National Laboratory and enjoys applying her scientific background to her current work in sustainability.